December 12, 1928 – Colonel W. C. Weeks, the United States district engineer in Chicago, states that he will recommend the issuance of a permit for the construction of an outer drive link bridge across the Chicago River. Almost immediately a bill asking congressional approval of the bridge is sent to Senator Charles S. Deneen and Congressman Charles R. Chindbloom in Washington, D. C. Weeks is persuaded, in part by the words of James Simpson, chairman of the Chicago Plan Commission, who wrote, “The people of Chicago will be unable to obtain the full benefit of the millions of dollars which they have spent in creating the lake front parks and drives unless they are properly connected so that the entire, development will be accessible to all sections of the city … Traffic movement is increasing continually and the delay caused by insufficient river crossing results in a very large loss to all those who are affected by traffic congestion upon our north-and-south streets.” [Chicago Daily Tribune, December 13, 1928] The above photo shows the mouth of the river just a bout this time ... note that the bridge at Michigan Avenue is the last bridge before the lake. December 12, 1943 – With United States war production at full throttle the Chicago Daily Tribune announces that the Illinois Institute of Technology has developed the “mightiest program in its history and a record of having become the busiest as well as the biggest engineering college in the country.” [Chicago Daily Tribune, December 12, 1943] The school is running a twelve-month calendar with three 16-week terms with all holidays, except Christmas, eliminated from the schedule. Classes begin at 7:30 a.m. and continue until 5:20 p.m. The grueling schedule turns out certified engineers in 30 months. “Frills in college life have been discarded,” the paper writes. “Graduation ceremonies cut to the minimum as senior classes increase in number, and, if four weeks of the year were not the absolute smallest amount of time needed for registration and administrative work, college officials say these weeks would be utilized for classes.” The school is spread out across the city with classes taking place in 27 separate war plants. 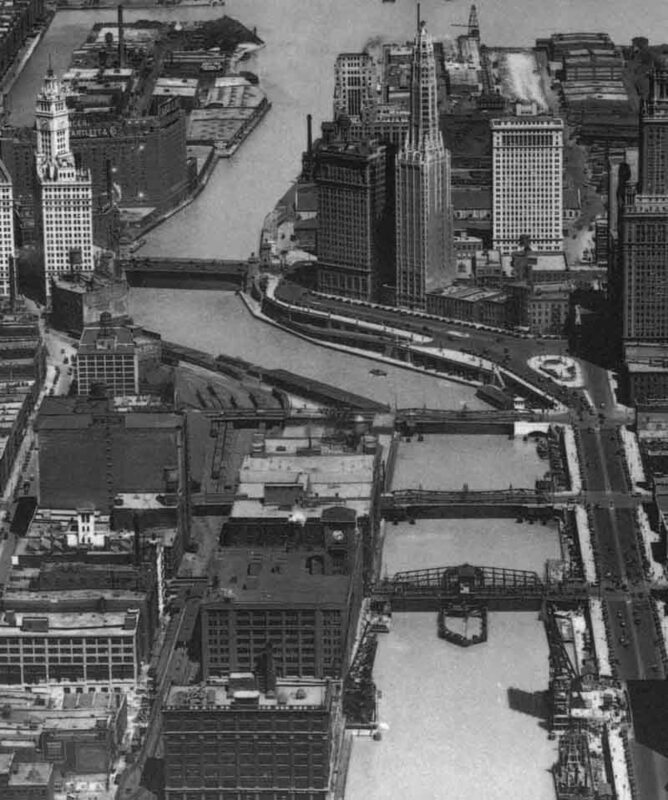 Classes are also being held at the John Marshall Law School, George Williams College, the Civic Opera Building, and 333 North Michigan Avenue. 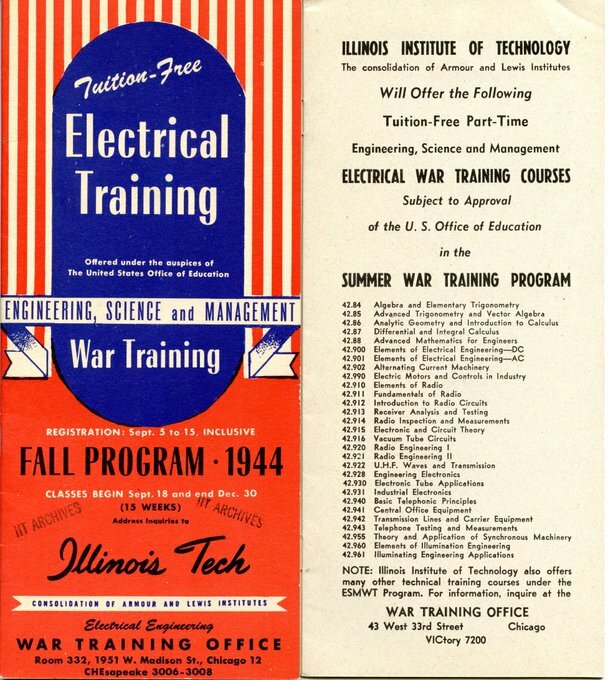 Since the United States entered the war in December of 1941, 34,256 students have been enrolled in courses at the school with the enrollment standing at 4,665 as the year comes to an end.